This 24-page activity book and companion DVD are based on the Money Savvy Kids Basic Personal Finance Curriculum. The book is packed with activities to help kids build money management skills. 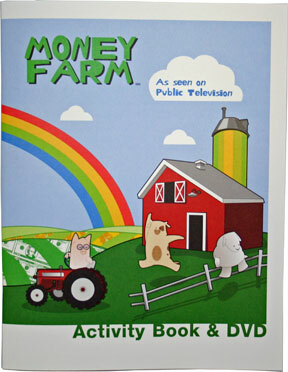 The DVD contains 12 segment of Money Farm which were generously funded by Chase and produced by Chicago Public Television (WTTW). These Emmy-nominated, video segments introduce kids talking to kids about saving, spending, donating, investing, earning money, the history of money and other interesting facts about managing your money. Kids will want to watch these over and over again. Running Time: 30 minutes. 11. Do You Want to be a Millionaire? 12. Family Money Press Conference. Copyright 2005 Money Savvy Generation & WCCI.